Despite it usually clocking in as the “No. 3” romance in Spider-Man history (behind Gwen Stacy and Mary Jane Watson), Spider-Man’s dalliance with Felicia Hardy, aka, the Black Cat, in the early/mid-1980s is arguably more interesting in terms of characterization and complexity than any others relationship in Spidey’s history. 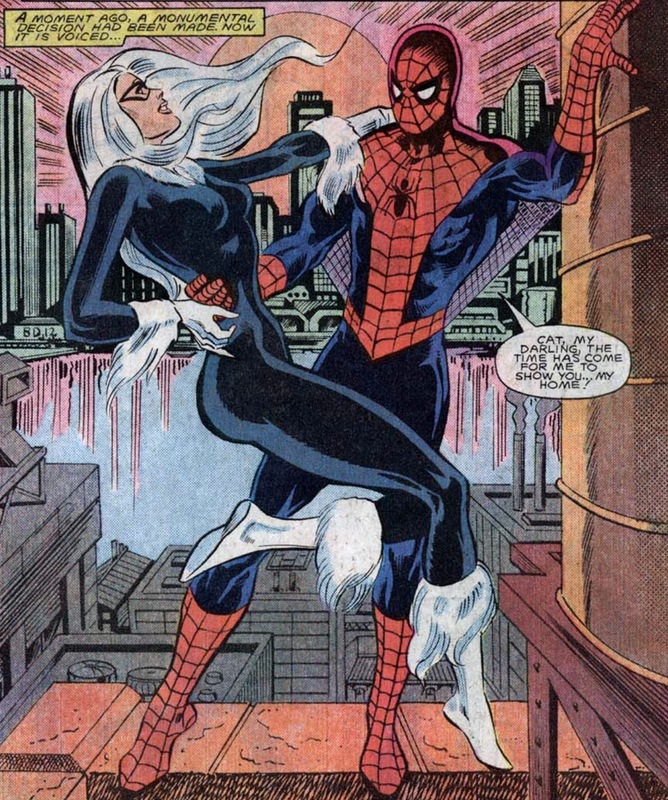 For one, Spider-Man/Black Cat is intrinsically different than Gwen or MJ because the two go about conducting their romance as costumed characters, rather than their actual identities as Peter and Felicia. That dynamic alone is something that offers a treasure trove of things to dissect and analyze about these two characters. 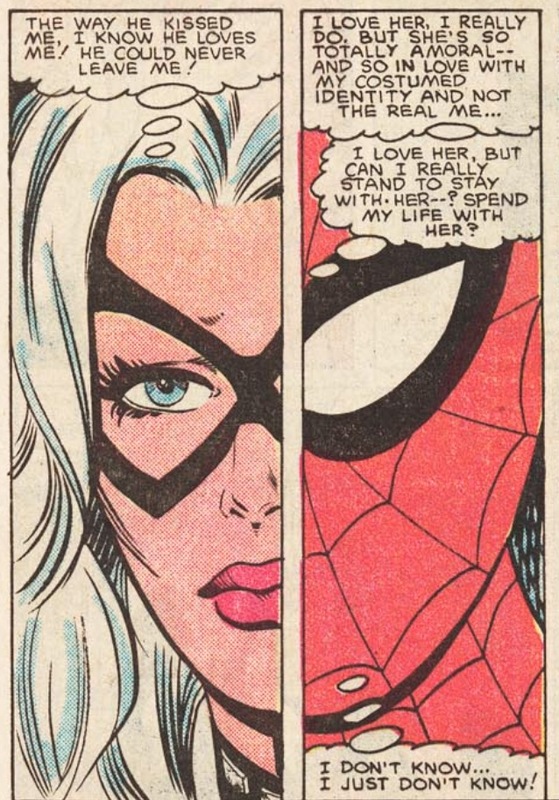 And that’s just scratching the surface as to what made the Black Cat such a unique and fascinating romantic partner for Spider-Man over the span of more than two dozen issues of Spectacular Spider-Man in the early/mid 1980s. 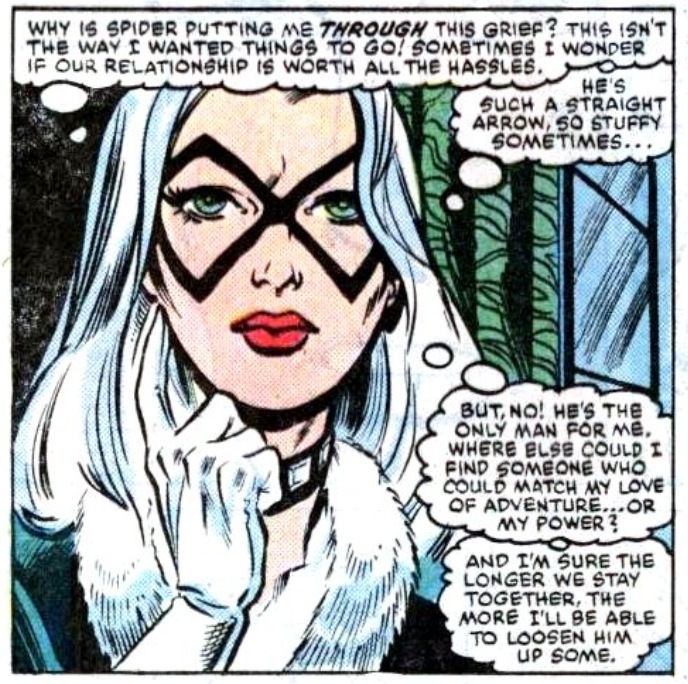 Adding further intrigue to this coupling is the fact that despite how passionate Spidey and Black Cat were with each other – and regardless of who was writing the comic at the timet – the relationship always seemed destined to fail. As discussed in last week’s lookback at Roger Stern’s Black Cat two-parter in Amazing Spider-Man #226-227, Spider-Man and Black Cat were just too different in terms of morals, ethics and personality. Yes, there is always an element of opposites attracting, but Spider-Man, by his very nature, is inherently “good” and responsible, while Black Cat is more spontaneous and selfish. 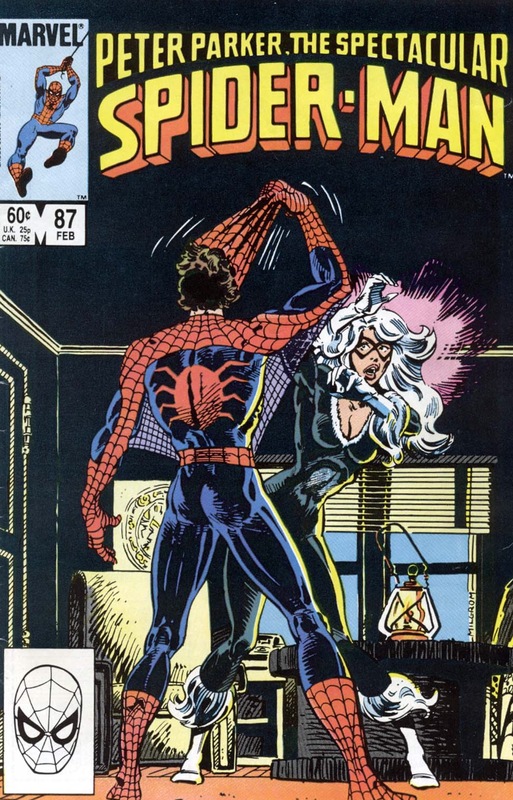 When the two give it a go in the Stern story, it only takes half an issue before Spider-Man realizes what a mistake he was making and that it was unrealistic of him to expect Felicia to change who she is. So when writer Bill Mantlo, and later Al Milgrom, revisited this romance in Spectacular Spider-Man, the whole thing read like a slow motion car wreck. It was never going to end up happily ever after for Peter and Felicia. These factors don’t change the fact that I absolutely love this storyline. 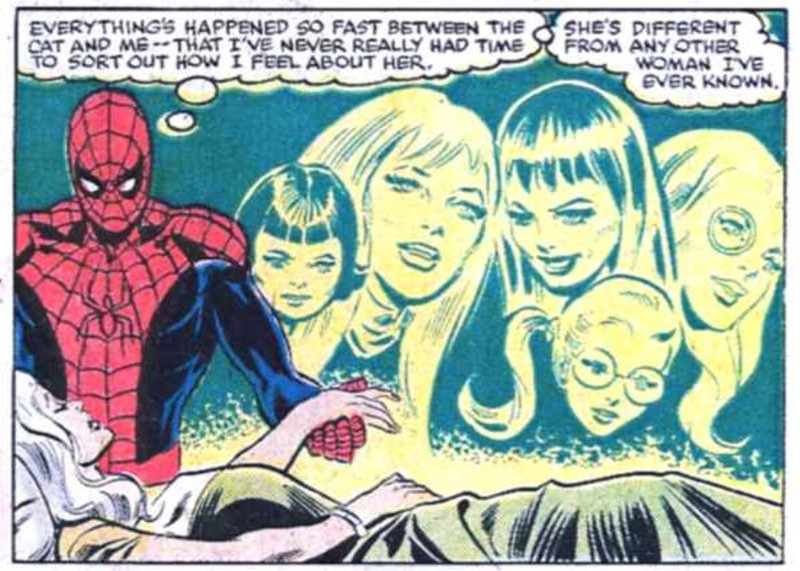 Sure, there are some moments of pure weirdness, like when Spidey, in costume, visits Felicia and her mother. Cat casually introduces her boyfriend Spider-Man and her mother seems nonplussed by the whole thing. I know if I brought home a costumed vigilante to meet my parents, it would at the bare minimum elicit a raised eyebrow and then a panicked phone call the very next day about what the hell I was thinking. But comics are comics, and a few oddball sequences here and there are not enough to spoil my overall enjoyment of this arc. Honestly, at the risk of sounding a bit kooky and “fanboyish” is I think there is an element of reader wish fulfillment that factors into my adoration for Spider-Man/Black Cat. Face it readers – while Peter hit the “jackpot” with MJ, there is something indescribably seductive and alluring about Black Cat. I understand that I’m talking about a fictitious, two-dimensional illustrated character, but regardless of who was providing the pencils and inks, Felicia was always depicted as being shockingly beautiful, and, dare I say, promiscuous. Any reader over 13 should understand that what kept Spidey and Cat together for so long wasn’t the hour-long games of footsy they played at the soda shop with Joanie and Chachi. There was definitely something “else” going on (which was pretty explicitly established by Kevin Smith in his “Evil that Men Do” miniseries). Besides, Peter’s first true love was killed by one his enemies, and his second love rejected his marriage proposal and dropped off the face of the Earth for a couple of years. I don’t blame him for reversing course and dating the “bad girl” for once in his life. I think even the most virtuous and chivalrous of men know that deep down, there’s a lot to learn about yourself and love by investing time in a fling like Felicia. 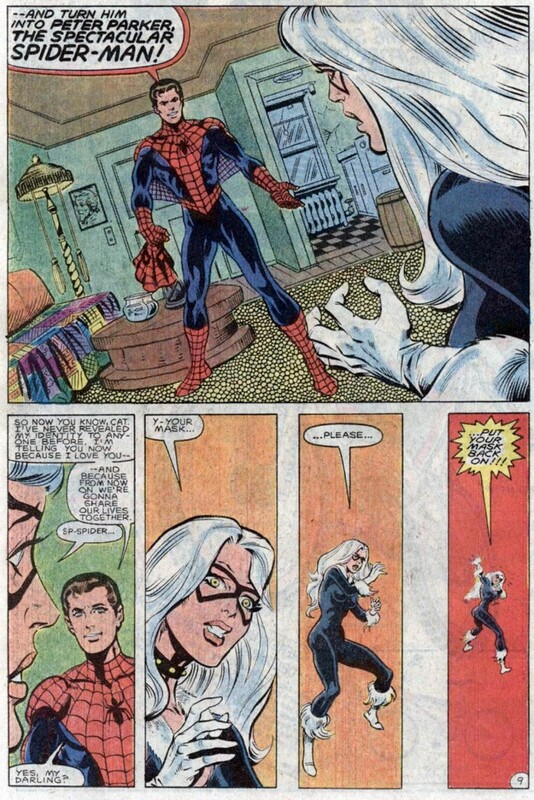 Before this post devolves into softcore Cinemax late night special territory, let me throw out there that I think there was more to Spider-Man/Black Cat than just “nookie.” A big part of what made this dynamic so special and unique was the fact that Felicia was the first woman who loved Peter as Spider-Man. This phenomenon of course ended up cutting both ways for Peter, which I’ll get to in a minute, but let me start with the positives. In all of his prior relationships – romantic or otherwise – the sword of Damocles that was always hanging over Peter’s head was the fact that he was Spider-Man. This secret, which he maintained in part to protect those that he loved, but also out of a touch of selfishness (think of how much stronger Peter’s relationships with Aunt May and MJ became once he admitted he was Spidey), was often the romantic death knell for Peter. In some cases quite literally. Once Gwen’s father was killed by Doctor Octopus and Peter was still holding tight to his secret identity, there really was no place left to go with their relationship. As a result, Gwen’s character was ripe to be picked off by Gerry Conway, in an effort to “shake up” Spider-Man’s universe. But Black Cat wanted to date Spider-Man. As someone who had to constantly live in a state of fear of what would happen if a loved one discovered his secret identity, Felicia’s uncompromised devotion to Peter’s costumed alter ego had to be quite a validating experience for him. And beyond her love for the costume, Felicia also proved capable of standing alongside Spider-Man in battle. Spidey was conflicted by Black Cat’s insistence to be his “partner” (and even used her to just take photos of him in action for the Daily Bugle), but she was far from the standard “damsel in distress” that Peter had been romantically involved with in the past. By effectively dismissing these old tropes – no one can know Peter is Spider-Man, and Peter’s girlfriends can’t fend for themselves – Mantlo and Milgrom opened up a number of potential storylines that had not been addressed before in the Spider-verse. As a result, the Spider-Man/Black Cat coupling as featured in Spectacular Spider-Man feels fresh and exciting. It didn’t matter that the primary antagonists during this arc were D-List villains like The Answer and Spot, because it was the adventures of Spidey and Cat that was driving the book. 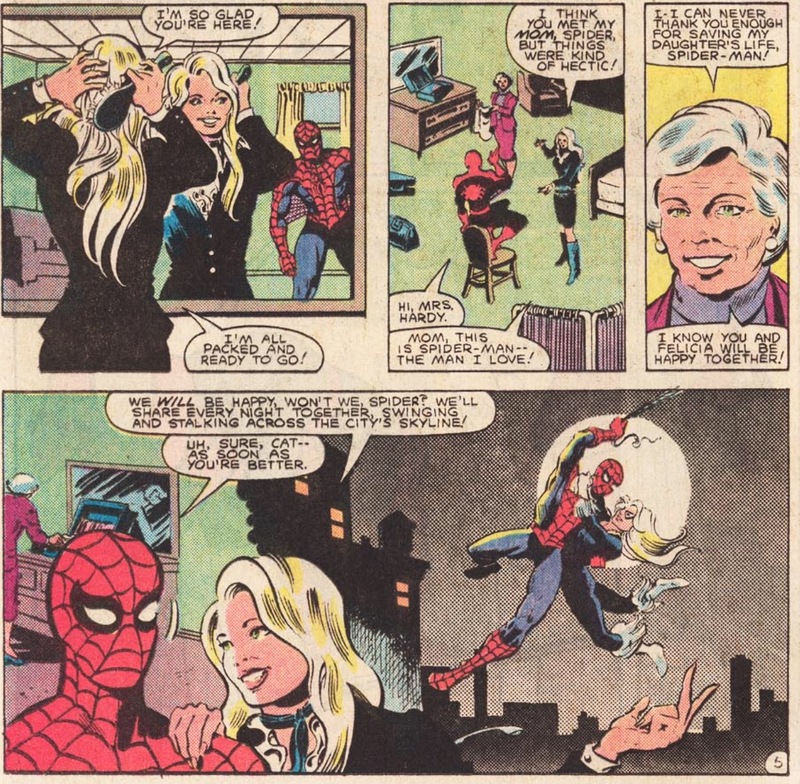 Prior to Felicia, Peter’s past girlfriends functioned primarily as plot devices – a villain would attack while Peter was on a date or out somewhere in public with Gwen and MJ and the drama focused on how Peter managed to slip into his Spider-Man costume without his significant other noticing and/or thinking he’s a coward that’s ducking a fight. With Black Cat, she was the featured character and all of Spectacular’s events and developments had a tendency to circle around her. This change in narrative focus made the eventual dramatic hammer dropped by Mantlo and later Milgrom, that much more powerful for the reader. When Spider-Man lifts his mask and reveals himself as Peter in Spectacular Spider-Man #87, Felicia’s reaction is so shockingly unexpected, it is gut-wrenching to watch as a third-party observer. She is actually horrified by the sight of Peter – not because he’s ugly, but because he’s just a guy. For the same reason that readers tend to identify with the character, Felicia rejects him. Mantlo never tends to get enough credit as a Spider-Man writer because his name was attached to some very silly stories that were really more indicative of the era than his actual storytelling abilities. His handling of Spider-Man’s unmasking in Spectacular #87 is really one of the best things that has ever published in an issue of Spectacular Spider-Man. 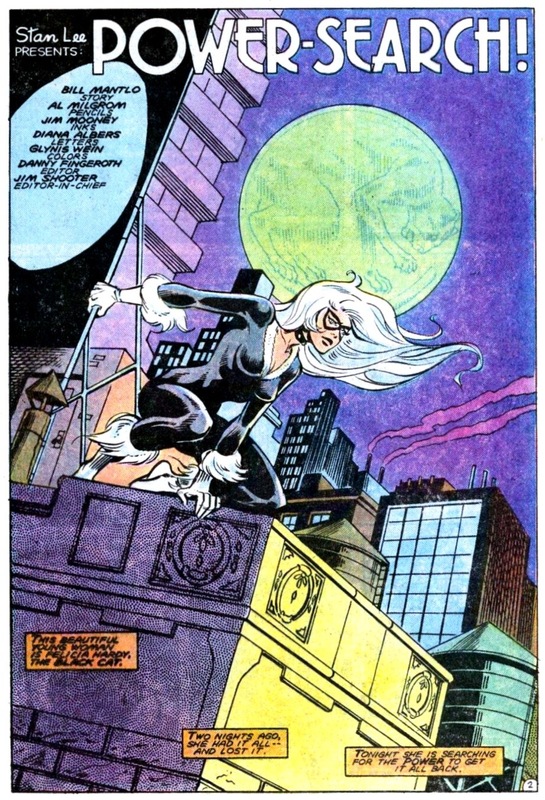 As for Felicia’s desires to be a part of the action, Milgrom takes over the second-half of this long-running arc, and introduces this interesting subplot where Cat canvasses the Marvel Universe looking for someone that can supply her with “powers.” While Black Cat was totally capable as an acrobat and in hand-to-hand combat, she often found herself fighting way above her pay-grade when Spidey took on supervillains like Doc Ock and the Hobgoblin. As a result, she believed having a powerset would not only keep her better protected, but would also validate her in the eyes of Spider-Man. It’s fascinating to think that someone who on the surface looks like she’s holding all the cards in the relationship – her rejection of Peter’s “real” identity truly stung him on a very profound level – can feel inadequate and desperate as well. Felicia’s desperation causes her to seek out Wilson Fisk, aka, the Kingpin of crime, to give her actual “bad luck powers.” Kingpin obliges because he secretly hopes he can use Cat’s powers to take down Spider-Man. Felicia doesn’t even think of the potential consequences of having bad luck powers and then swinging around with Spidey as his “partner,” which interestingly reads as a callback to Spidey’s origins in Amazing Fantasy #15 where he acquires these powers but doesn’t consider the consequences of not using them responsibly. 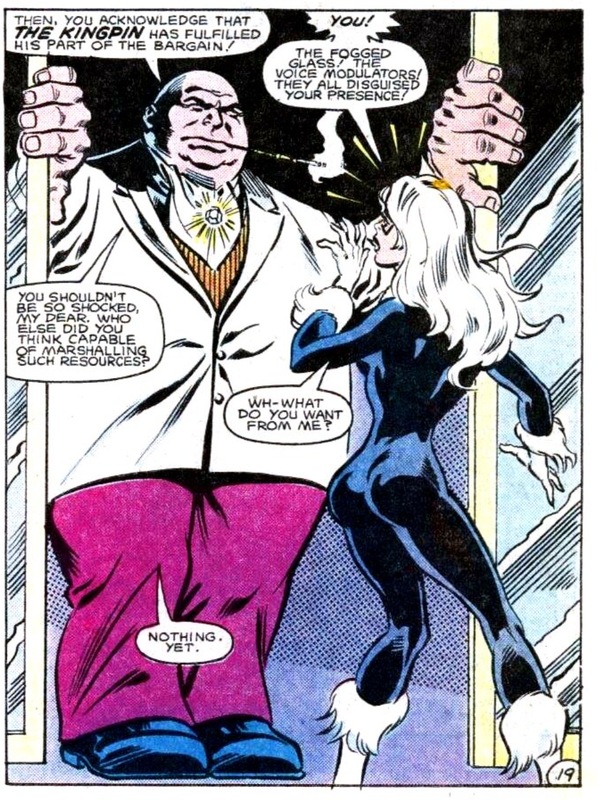 In a bit of a surprise, it ends up being Black Cat’s deal with Kingpin that sinks her romance with Spider-Man, rather than the fact that she made him feel like a schmuck after he unmasked himself to her and revealed his civilian identity. And yet, like any bad breakup, EVERYTHING that transpired between Spidey and Black Cat played a role in the relationship ending. After this Spectacular Spider-Man arc, a few other creators teased a Peter/Felicia reunion, most notably (and oddly) Peter David in Amazing Spider-Man #289, which took place exactly one issue before Peter proposed to MJ and soon after married her. In fact, that plot development was such a shock to Felicia, after she got her face smashed in by Venom in ASM #316, the thing that seemed to hurt her most was when the villain mentioned that Spider-Man was away with his wife. Post-MJ-marriage, Felicia would still be portrayed as being starry eyed for Spider-Man. Outside of one or two storylines, I was actually shocked that other writers didn’t go back to the Spider-Man/Black Cat well with consistency in the post-One More Day Spider-verse, but I guess part of what makes this romance special is how Marvel didn’t run it into the ground once it had reached a definitive end point. I’d disagree on one point: while I’ve always loved the -idea- of Felicia being indifferent, or actively hostile to, Peter Parker as opposed to being in love with Spider-Man, the -execution- of that scene has never sat well with me. She’s practically having a panic attack when he unmasks, and aside from being ridiculously over-the-top, it robbed that aspect of the storyline of a more emotionally-satisfying payoff, in favor of an emotional sucker-punch in the short-term. How much more interesting would it have been had Felicia kept her cool, and gradually tempted Spidey to blow off more and more of his life as Peter Parker, until the dam bursts and she finally admits that Parker bores her? The whole situation points to another fatal flaw in their relationship: the dichotomy of Pete’s identity. There’s no division between Felicia Hardy and the Black Cat, and there never has been. An aspect of their breakup that I did appreciate was Felicia not understanding why Peter puts up with crap in his personal life that Spider-Man shouldn’t have to; she can’t comprehend this basic aspect of his character because, from her perspective, there -shouldn’t- be a division. It’s why the (admittedly-hilarious) scene of Spidey meeting her mother works: Mrs. Hardy knows her daughter is the Black Cat, so why wouldn’t she possibly date another costumed character? As for the deal with the Kingpin, I think that it really drove home the point to Pete that, while she may not be particularly malicious compared to most of his other rogues, the Cat is still kind of a super villain, even if she’s prone to spontaneous selfless behavior from time to time. At least, I’ve always preferred that interpretation of her, as it makes the stories she’s in more unpredictable and entertaining. The Black Cat was definitely an awesome girlfriend and provided a great spark for that time period. I really want for Peter in the future to date a female super hero. He has a lot going for him and it is time to step up to someone who can hang with his superheroing and his Parker side. Not sure who that would be, but there’s got to be someone. I still love MJ especially when she done as a supportive wife. Carly took forever to like and it wasn’t till she got her Spidey tattoo that I actually liked her. However she didn’t have a strong visual and I can’t place her if she is in a crowd like I could MJ or Gwen. I read these issues recently, trying to find a connection between Felicia’s past and her current status quo as an outright supervillain. While I still don’t think the change in her character works as written these days, it is still possible to identify Cat’s amorality in these early stories. All that said, I did not care for this era of Spectacular (1984-early 85). I like Mantlo in general, but his handling of Cat’s reaction to Peter’s reveal felt incredibly sloppy and unrealistic. Things only got worse under Milgrom (I’ve never liked his writing, and The Answer is probably my least-favorite Spidey villain ever), so by the time he and Felicia were gone from the title I was glad. I still have some other stories to read, but you could make a case that the Black Cat has never really recovered from this mishandled storyline. tcp i have read your review do you think black cat should? be in this one? i really do i am not going to see this if she is not no more this movie code be awesome if we get spider man vs black cat right!! see this is awesome black cat and spiderman in the comics are together!! now for me i don’t need to see them as a couple right now cuz for 15 years the spider man films have say’d we’d see black cat and i know she was in the amazing spider man 2 as felicia hardy but i am not happy with that i really badly need to see black cat vs spider man you know black cat in her cat shut please i had it if her is not in this film i am not going see this in thaeters of get the blueray or ever watch any new spider man films ever again understand no black cat vs spiderman and no more me to see it and i will let all my facebook freinds know stop seening this we all wanted to see black cat last time i loved the cartoons but nrver get to see her in the spider man films this is the chane to have or i am done do you here? me black cat vs spiderman now!!!!!!!!!!!!!!!!!!!!! It’s a shame this retrospective cuts off where it does. While the romance proper ended at the point this blog cuts off, Felicia matured as a character thanks to developments through the 00’s, and this included how she saw Peter and realizing how silly she was during the time they were together. She had come to love Peter as the man also and not just the hero, but this was still pre-OMD so anything romantic was off the table. And then with Brand New Day, her character was basically regressed by her knowledge of Spider-Man’s identity and therefore her friendship/romance with Peter going up in smoke.